Dairy Science student, Sarah Harn, just graduated this winter.Make sure to look for Sara’s feature in the Holstein News this January. In the mean time please check out a sneak peek below. The biggest college football event in Lambeau Field history is coming! The Wisconsin Badgers take on LSU’s Tigers in the season opener for both teams September 3rd in Green Bay. Even College Game Day will be there to mark this historic occasion. 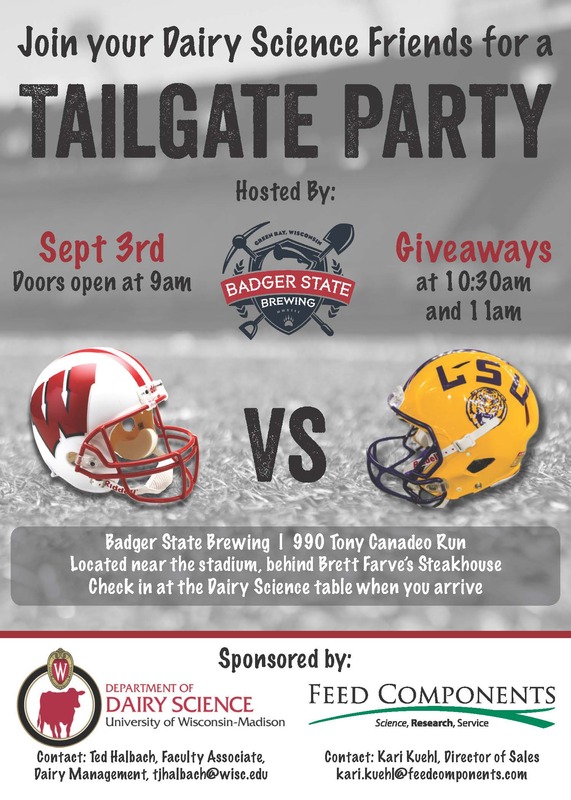 Something this big deserves an epic celebration so Dairy Science is partnering with Feed Components to host a pre-game tailgate party at Badger State Brewing, 990 Tony Canadeo Run where alums and dairy industry personnel can socialize, network and have fun prior to what we hope is a huge Badger win. 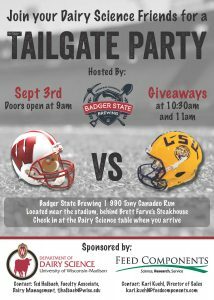 The game kicks off at 2:30pm, so be sure to arrive bright and early to enjoy some of Badger State’s award winning brews! Admission is free and doors open at 9:00 AM. The format will be a cash bar with beer specials and giveaways for those attending the tailgate. For additional information contact Kari Kuehl at (262) 203-4016. 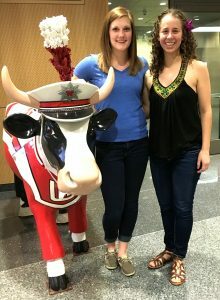 Two undergraduates from the UW–Madison Department of Dairy Science have been selected to attend the Agriculture Future of America’s annual Animal Institute. Only approximately 90 students are selected each year to travel to the three-day event April 3-5, and Micheala Slind and Sydney Endres are among them for 2016. The Animal Institute is held in Kansas City, the heart of the Animal Health Corridor, which is a cluster of animal health companies along Manhattan, Kan. and Columbia, Mo. At the event, students will learn about animal-related career opportunities and connect with industry leaders. Slind and Endres will also visit area animal health services and businesses and attend an industry dinner where they can network with corporate leaders. In order for students to be selected for the opportunity, they have to display industry and leadership involvement, possess career goals in agriculture, and show how the program can benefit their career development. The 2014 4-State Dairy Nutrition and Management Conference is fast approaching on June 11-12 at the Grand River Center in Dubuque, Iowa. The conference will present the latest research on issues concerning the dairy industry including feed efficiency, calves and transition cows. The program starts on June 11 with a pre-conference symposium. Milo Wiltbank will cover reproduction and amino acid balancing and Dan Luchini will discuss the benefits of feeding methionine during transition. Other topics include amino acid balancing for lactating cows and factors affecting vitamin availability. 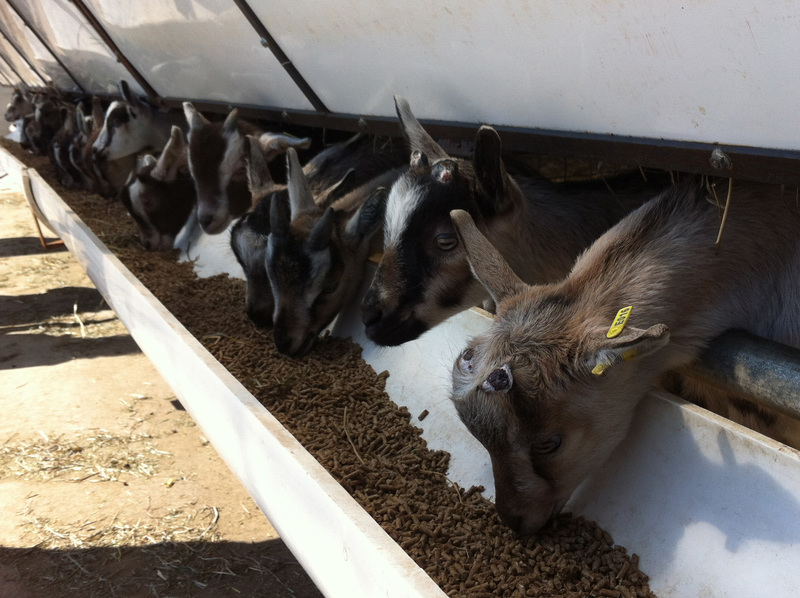 • Can genomics improve feed efficiency? • The first 60 days: can we make it better? • Can amino acids improve use of non-milk proteins on milk replacers? “This conference has more than 20 different speakers during the symposium and breakout sessions. Every producer will find something relevant to their work in the dairy,” said Jim Salfer, University of Minnesota Extension educator. Other topics to be covered include understanding mastitis diagnostic results, dairy title of the farm bill, dairy nutrition models, hemorrhagic bowel syndrome and transition cow crowding. For more information and to register, visit http://wiagribusiness.org/fourstate.php or contact Wisconsin Agri-Service Association, 608-223-1111 , or Jim Salfer, Extension Educator at salfe001@umn.edu or 320-203-6093 . The conference registration fee is $150 early until May 31 and $175 after. Lunch and social hour sponsorship opportunities still available Missed getting a team signed up for this year’s Department of Dairy Science’s Dave Dickson Memorial Golf Classic? Starting to get spring fever with the warmer temperatures and greening lawns all around us? You are in luck! Spots for two additional teams opened up this week and will be filled on a first-come, first-served basis. The golf outing is next Wednesday, May 21 at the University Ridge Golf Course in Madison. The Golf Classic uses a scramble format, where each team member plays the ball closest to the hole after each shot. The event is open to the public. A registration fee of $120 per golfer pays for 18 holes of golf, cart rental, free lunch and lots of prizes. All proceeds support the dairy science department’s scholarships and dairy judging and dairy challenge teams. Last years outing raised nearly $30,000 for those programs. Individuals or companies can still support the event through a sponsorship or donation. A lunch sponsorship for $2000 is available and comes with special event signage and a golf foursome. A social sponsor for $600 that includes special event signage is also still being sought. There will be both a silent and live auction, featuring a variety of dairy-related items and sports memorabilia. Auction items can be viewed at http://dysci.wisc.edu/ under either the alumni or donor tabs. Contributions beyond the actual cost of the golf or any auction item are tax deductible, as allowed by law. Don’t delay! To register or to learn more about donations or sponsorships contact Cathy Rook by email at rook@wisc.edu or phone at 608-263-3308.